Daniel and I are currently driving back from our mini-vacation in Hilton Head Island. We’re on 95 to be exact. 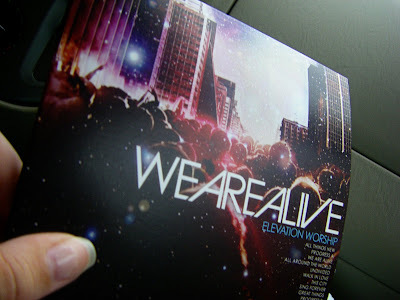 We are listening to our church’s brand new cd (that will be released tomorrow) ‘We Are Alive.’ Pastor Furtick has said that these songs are our stones. Stones from what you may ask? When Israel crossed over the Jordan river, God instructed them to set up 12 stones as a continual remembrance of his miraculous power. Pastor Furtick couldn’t be more right. As I listen to each song, I think of all that GOD has done for Elevation Church and I’m so thankful that he has allowed us to be a part of this movement. We are HIS humble servants and God, and God alone, receives all the glory for all we do and for ALL the lives that He is bringing to himself. Lord, you are worthy. I am incapable of having the words to use to describe all that you are and All that you are worthy of and of all that you deserve. Daniel and I would like to give Ryan Hollingsworth a big shout-out for the top-rate AMAZINGLY divine artwork for this album. When I get famous and sing ‘Legacy’, will you design my album work? Wade, Mack & Chris….God has rocked our socks off with this album and the songs in it. God couldn’t have chosen 3 more inspiring musicians! Pastor Furtick’s song that he co-wrote with Carl Cartee, ‘Here in this Place,’ has me in tears every time I hear it. The lyrics couldn’t be more appropriate for what our church exists for. All of you that are reading this blog…you MUST get a hold of this album. Whether you attend Elevation or not….this music is right on.